The Lauda Alpha A24 Heated Bath provides large capacity pump circulation, that covers most basic thermostatic applications. This immersion bath has a temperature range between 25 and up to 100 °C in an easy to use, 3 button digital LED control, reliable thermostat. The alpha thermostat is suitable for operation with non-flammable liquids such as water, or water/glycol and for both internal and external thermostating tasks. This heated water bath can be calibrated by the user through a 1-point calibration and the accompanying water bath holds between 18 and 25 liters. To prevent running dry this lab heated bath features a low-level protection alarms that are both audible and visual, with an automatic pump and heater shut off, and an auto shut off after a preset time. The Lauda Alpha A 24 can be programmed for time, temperature and flow rate easily from the clearly legible display. 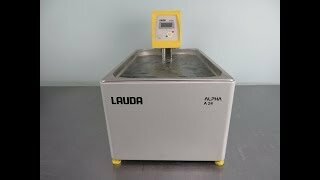 This Lauda Alpha A24 Heated Bath has been fully inspected and reached is flowrate and temperatures without issue. All of our lab equipment comes backed with our standard warranty. Should you have any questions, please don't hesitate to contact us.